HISGRAIIN Commodities Inc., together with John Bancroft, OMAF and MRA, Kevin Simpson, Bert Caputo, and Mike Tregunna of RBC Dominion Securities Inc. and other industry partners are offering a Gross Margin Management (GMM) workshop for Swine Industry producers. The objective of the workshop is to provide greater detail about the process and mechanism for using Hog Futures, Corn Futures and Soybean Meal Futures to lock in a Gross Margin for hogs going to market in the future i.e. as much as 1-2 years ahead of actual marketing. The workshop will use actual prices during the past 5 years to illustrate the actual process and mechanisms. We will also highlight the opportunities that do present themselves and how we as an industry can take advantage of such opportunities. The USDA Cold Storage report yesterday indicated that total red meat in storage at the end of April was up 3% from last year and up 5% from March 2013. Total beef in storage was down 2% from 2012 and down slightly from March 2013. On the other hand, pork in storage was up 6% from April 2012 and up 8% from March 2013 mainly due to a 12.5% increase in ham stocks. 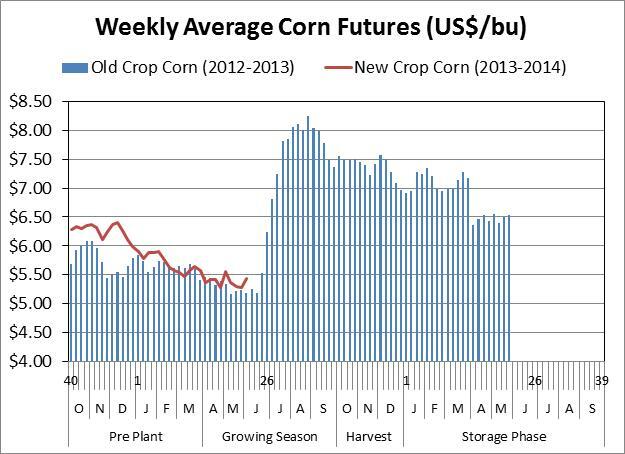 The pork in storage was a record level for the month of April, bearish news for the hog market. The good news from the report was the stocks of bellies in storage was down 25% from April 2012 stocks. 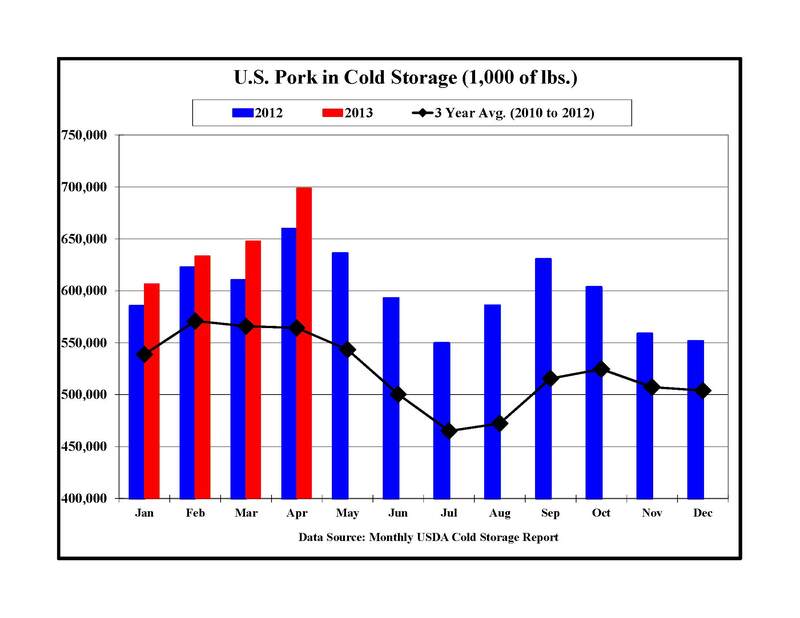 As depicited in the graph, pork cold storage stocks should start declining over the summer months as production decreases and demand responds to the BBQ season. A popular recycling program for farmers is being expanded to include new products. In addition to accepting empty, clean pesticide containers, CleanFARMS will now accept plastic fertilizer jugs and pails (less than 23 litres) as part of its annual recycling program. Every year, approximately 4.5 million empty, triple-rinsed plastic pesticide containers are safely recycled into items that can be used back on the farm, for example farm drainage tile.